- Characteristics such as colour and taste describe matter specifically. - The temperature at which matter changes from a liquid to a gas. Called its boiling point. - Deriving pure substances and mixtures. - A mixture is a combination of different kinds of matter that retain their own properties. - Matter that is easily separated into component parts is called a mixture or said to be impure. How can you tell: Mixture or Pure Substance? - Shining a strong light through samples of water is an example. - If the light is scattered this means there is another substance in the water = mixture. - The addition of alum and lime to muddy water produces a gelatinous substance that can be used to trap impurities. - Note: light scattering cannot be used to tell if a material is pure. - Mixtures that look uniform throughout and do not scatter light are called solutions. Example: salt water, and sugar water. 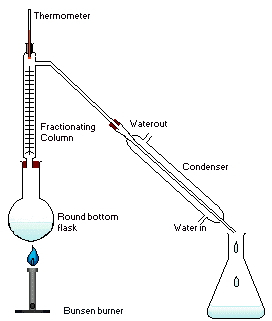 - Distillation is the evaporation followed by the condensation of vapors, which is used to separate the components of a solution or a mixture. 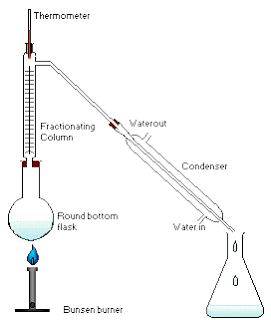 The above picture shows process of the distillation of water. This picture shows the difference between tap water and distilled water. - Many mixtures are exteremly difficult to separate and none of these techniques mentioned above can separate every mixture. Scientists are always working on new instruments for analysis and separation. - Pure substances have a constant boiling temperature. - It is easy to say that mixtures never have a constant boiling point but some do. Freezing Point: The temperature at which a liquid changes to a solid. Melting Point: The temperature at which a solid changes to a liquid. Density: A property of matter that describes its mass per unit volume. - Chemical change = changes that produce a new type of matter. They are not reversible. Example: When sugar is heated, it decomposes to form a black solid and gaseous products. Some of the gaseous products condense to form a clear liquid. - Decomposition = process where one kind of matter comes apart to form two or more kinds of matter. - Physical Change = changes that do not produce new types of matter and are easily reversed. - Although many pure substances like sugar and baking soda decompose when heated, the majority to not. Others have melting and boiling points. - Electrolysis involves passing an electric current through a substance, causing it to decompose into new kinds of matter. Example: When salt is melted and an electric current is passed through the melt, the salt decomposes to form sodium metal at the negative electrode and chlorine gas at the positive electrode. This is another example of electrolysis. Oxygen gas is produced at the positive electrode and hydrogen gas is produced at the negative electrode. - Electrolysis represents chemical change since the products have none of the original properties of the originals and they cannot be reversed. - Decomposition represents a chemical change because a single pure substance with constant characteristic properties is changed into new substances with different properties. - Distillation represents a physical change because the separated components exist in the original mixture as separate substances. The properties of the mixture are a blend of the properties of these components of the mixture. - Compounds are pure substances that can be decomposed into new kinds of matter. - Compounds are “compounded” or put together from simpler substances. - Elements are pure substances that cannot be decomposed to simpler substances. - There are now 109 known elements. Several of these elements are atomic reactors and do not exist in nature. Virtually all matter is made up of 85 elements. 8 of these account for 99% of the earth’s crust. All other elements make up 1% of its mass. Percent abundance of elements in earth's crust. - A principle stating that the proportion of elements in a specific compound is a fixed quantity. - Mixtures of elements can have almost any composition desired but compounds will have definite composition. - A principle stating that different compounds can be made having different proportions of the same elements. - A particular compound does not have multiple proportions like a mixture, rather, the same elements can form different compounds, each with a definite composition, but each having a composition that differs from the others. Macroscopic Observations- The more obvious observations made by feeling, seeing, and smelling. Macroscopic Properties- obvious properties such as a boiling point or mass. Microscopic Model- a small, rather than macro-, representation of matter. - Atom = the smallest unit of an element. - Each element contains a different type of atom. - There are kinds of 109 atoms. They are number 1 through 109 and that number is known as the atomic number. - An element can exist in a solid liquid or a gas. - Solids – atoms are stuck together so the solid holds its shape. Atoms do vibrate however and they vibrate more as the temperature is increased. - Liquid - when the temperature is increased enough atoms in a solid vibrate with such force that they overcome the forces that hold them together. The force of gravity pulls them down the liquid and as a result it takes the shape of its container. - Gas- when the temperature of a liquid is raised to its boiling point atoms move with such energy that they totally escape from the liquid and move far apart. Atoms in gases move in a straight line until they collide with other gas atoms or the walls of the container. Molecules = Particles that are made up of more than one atom. - Compounds are made up of two or more kinds of atoms. - The different atoms can be separated if enough energy is supplied to break the compound apart. Examples of energy: heat and electricity. - Compounds can exist as solids, liquids and gases. 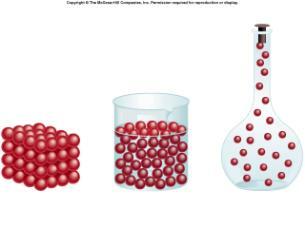 - Note: When a compound melts or boils, the molecules become unstuck but the atoms do not. Ions = Particles that have an electric charge. - Compounds that melt to form ions conduct and electrical current. - Compounds that do not melt to form ions do not conduct. - The only way to determine which compounds are ionic and molecular is to check for conductivity. Check out this youtube video for review on elements, compounds, molecules and ions.